Sounds so wonderful! I have never heard of the Saco cultured buttermilk before! I will have to look for it. I typically buy buttermilk for a recipe and then have to find more recipes to use it up! @Dulce Dough - Hi Jill! I found out about this years ago in my food catering course. I love it because the shelf life is so great...you do refrigerate once opened. I get the same results as regular buttermilk! Hope you try it! Like the plates and the glass ..where did u get them..
@SavithaRaj's Spice Land - Yes, I love this set of four plates and cups also! Each cup is a different pattern picked up from the plate. I can only tell you at this point it's probably considered vintage since the set was a wedding gift (& I don't know where purchased). However, on the back it's stamped "Taste Setter Collection"...if you want to try a search online! Good luck! Bonnie--where would I look for it at the grocery store or at Walmart? Is it with dairy or baking? @Dulce Dough - Hi Jill! I know Kroger and Walmart has it...not the refrigerated section though. Try the baking section and/or canned & dry milk area (can't remember exactly where). It's a medium sized (12 oz.) paper can w/red plastic lid and has a smiling cartoon chef on the can...it also says "for cooking and baking". If you don't see it, ask for the manager. Good luck and pls.let me know if you find it! Now these look like muffins that could start a day off right! I love bran muffins. Thank you for sharing another tasty treat with me today. Your culinary creativity inspires me in my own baking endeavors. I hope you had a good Monday. Smiles and love this week! 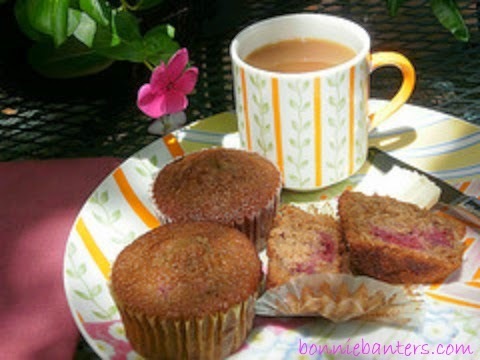 @Monet - Bran muffins are such a comforting food, and the raspberries just make your day a little sweeter. Your encouraging remarks are truly appreciated! I hope you have a great week! Kisses! Mmmm these look like great on the go breakfast treats! Which in our house is a must!! @foodies at home - Funny...I was just thinking the same thing the other day! Thanks for dropping by...please come again! You sure captured that perfect easy morning feeling in your photo. Makes me want to start my day all over again! Well, there''s tomorrow isn't there? Lovely recipe! @Cheryl and Adam @ pictureperfectmeals.com - Thanks so much...that really means a lot coming from the pros! I usually have muffins for tea-time. Muffins are must have in my tea-time list. And your muffin just made the list! I also liked the fact of adding raspberries in your muffins because raspberries have great health advantages. thanks. @CNA training - I'm honored my muffins have made your tea-time list! You're right...they make a wonderful and healthy afternoon snack or for tea. Isn't it great that the tasty raspberry has so many health advantages!